This is a phrase that is often in my mind. It came to live in my brain when I was reading Richard’s Foster’s Celebration of Discipline. There is a chapter on Study, with a discussion of what we put into our minds is essential to our mental and physical health, as well as our spiritual growth. In the book of Romans, Paul begins Chapter 12 this way. I appeal to you therefore, brothers and sisters, by the mercies of God, to present your bodies as a living sacrifice, holy and acceptable to God, which is your spiritual worship. 2 Do not be conformed to this world, but be transformed by the renewing of your minds, so that you may discern what is the will of God—what is good and acceptable and perfect. Do not be conformed to this world, but be transformed by the renewing of your minds. This has been my goal for many years now. I try to place my thought processes before God and reflect on whether they are of God or even worthy of God. It was truly the way I stop worrying about my life (besides making myself say Philippians 4:6 –6 Do not worry about anything, but in everything by prayer and supplication with thanksgiving let your requests be made known to God. over and over again in my head) The question that I asked myself was whether or not I trusted God with my life? – the answer was yes. Then the question is, does God have the power to transform my life if I open myself to God? – well, God did that whole resurrection thing with Jesus, so it seems that even death is not a barrier to God – so that would be a yes? Then if I trust God and believe that my life can be changed, then what was there to worry about??? I also know that my emotions are informed more by what I think and not the other way around. I am sad because I am thinking sad thoughts. I am not forced to think sad thoughts, so I could choose some other pattern of thought (with God’s help). Imagine what a better day you could have if you decided just to think about God, and positive things and about how you could make other’s lives better and learn a Bible verse. You can have a joyous day. So here’s the story. I went into CVS to make some photos from my niece’s wedding. When I was printing them from the machine I noticed that there were already stacks of photos in the slots. I fact, I had to pick my photos out from the others. So, I put those photos on top of the printer. When I went to pay for my order I told the clerk what I had done. In a stressed out voice and rush of words she said she had just been too busy to take care of it. So I gave her my credit card and it was denied. I said it happened yesterday and I guess I would have to call the number and figure out what was wrong. She said, again in the stressed out voice, “Aren’t you worried, something wrong with your card, you should be more upset. . . I would be really upset.” In my calm voice I said, “I’ll probably figure it out sooner or later, probably it will be alright, but worrying about it will not change the reality.” Of course, she just looked at me like I was crazy. I told her I would pray that she had a calmer day. and finally I said, “relax and enjoy the moment, this is the only time you will get to have this one.” There was more weird looks at me as I left. If you are wondering, I did call the credit card people and found out there had been suspicious charging on my card. Apparently, someone in California was changing Pizza and Beer to my card and I wasn’t even invited! It’s all worked out and they are sending me a new card. No worries. 1-2 So here’s what I want you to do, God helping you: Take your everyday, ordinary life—your sleeping, eating, going-to-work, and walking-around life—and place it before God as an offering. Embracing what God does for you is the best thing you can do for him. Don’t become so well-adjusted to your culture that you fit into it without even thinking. Instead, fix your attention on God. You’ll be changed from the inside out. Readily recognize what he wants from you, and quickly respond to it. Unlike the culture around you, always dragging you down to its level of immaturity, God brings the best out of you, develops well-formed maturity in you. Go for it and have a joyous day. It truly is your choice. This photo taken of my dad in 1945 . Those who experience World War II have been called The Greatest Generation. There are many people who will talk today about the service and sacrifice they gave to our country and give thanks for those who continue to service in our military today. I agree whole hardheartedly with this praise of those who serve. This morning I would also like to reflect on how the experience of World War II changes lives. Again, there are a thousand books and a hundred TV shows that will talk on this topic, but I guess I will add my two cents. My father joined the Navy when he was 17 years old. He had just graduated High School and had to get signed permission to join. My grandmother signed the form. My grandfather had abandoned the family when my Dad was five. The War opened up a whole new world for my dad. 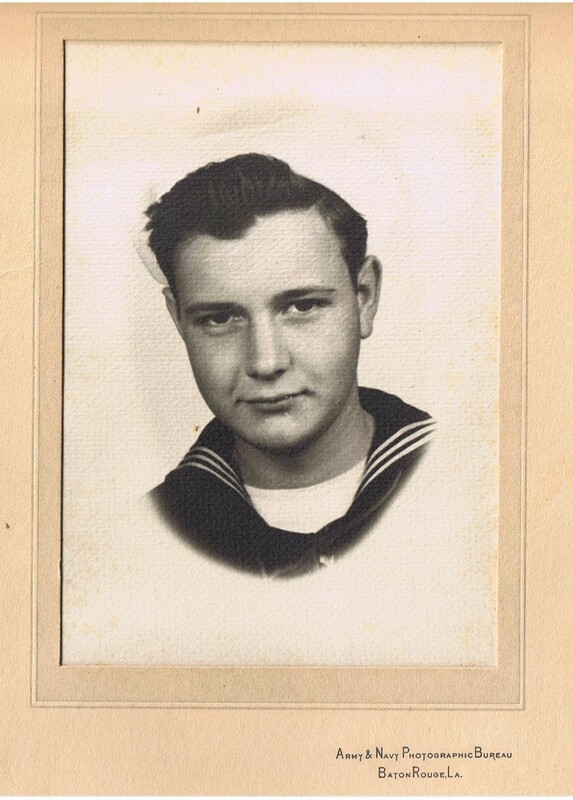 Not only was every one “joining up” after the Pearl Harbor attack, but it gave my dad a way to “get out of town.” At seventeen he was on a Liberty ship moving supplies from one part of the world to the other. He talks of being in the South Pacific and docking in France and Wales. No one in his family had traveled out of Virginia. He talks about calling home and talking much of the time with the switch board operator who knew all of the news around town — it was a small town. When he returned he had the G.I. bill to pay for a Bachelor’s degree from Virginia Tech. The day after graduation, he married my mom. He still lives within a 100 miles of where he grew up, but his world view had changed. I have talked with a number of lives when their WWII vet has died and the story is similar to my Dad’s. They had grown up in rural/small town America, then join the branch of service that interested them the most, Navy, Air Force, Army, and it became a passion the rest of their life. Men who had never flown in a plane joined the Air Force and continued to work with planes the rest of their lives. I know we talk about the big stuff, about how the world was changed through the experience of war. Yet, maps are not the only things that are re-drawn in a war. My dad came home from the war and so I exist. I am glad did not have to be in a deadly battle; at least he has never talked about an experience of people dying during the war. A number of years ago, I was with my mother’s brother when he was dying. He had been a medic in the war. At the point of his death, he talked with great pain about the lives he had not been able to save during the war. He talked about a promise to one young man to contact his family and tell them how he died. My uncle had never kept that promise and he spoke about again and again during his last days of life. We had never had a clue about this guilt. I really love the Bible. I can read through a text a hundred times and then on the 101st reading, I find something incredible. I have heard the beatitudes all my life and never really liked them. It just sounded like an ongoing list that did not make a lot of sense to me. I know the “peacemaker” line is nice; but really, what does it mean??? Maybe it is all about verse 12 and encouraging the early Christians. They had a really tough time (i.e. could have been killed) for living their beliefs in Jesus as the Christ, the son of the living God. But, like I said, I finally had an insight after reading this list for the 101st time. Maybe Jesus was one more time trying to tell the people how much God loved them. I know it is easier to believe God loves me when I do something well or am bold in telling others about my faith. But here, God is blessing those who morn, those who are meek, those who are even poor in spirit. I should have seen it sooner; God is always blessings us. No matter where we are, no matter what we are doing. Even when life is not going well. Even when our faith is weak and we have trouble believing the wonder of the Divine. God says we are blessed. Maybe we feel like saying, “Screw you God, I don’t feel blessed” (I have had these kind of days). But our faith is not about feeling, it is about believing. It helps me to know that on my worse days; God says that I am blessed. I have literally spent years intentional trying to find God’s blessing everywhere. But I must confess, that it too often the blessing rested on my faith and strength and emotions. I hope in the future I can remember in times that life sad and painful that God’s blessings is there. The human reality that I do not feel it does not remove the Divine reality that it is there. You are blessed, I am blessed. . on good days and bad; when our loved ones are safe and when they are not; when our bodies are healthy and when they are not; when life turns out just the way we planned and when it does not. I continue to to seek the blessing, it is like a path of crumbs to the presence of the living God. Is it surprising that our world focuses on Halloween rather than All Saint’s Day? The focus has been on dressing up, becoming altar-egos, and scary movies. The best I can say for Halloween is that little kids look cute and a free sugar haul is not all bad. Yet, the original focus of All Hallow’s Eve was preparation for All Saint’s Day. And my guess it that most of the world doesn’t even know that All Saint’s Day exists. [I don’t think the hosts of the Today show will dress up as their favorite saint!] It is such a loss. I think it is the saints of the church and in our lives that inspire us to be our best selves – ourselves transformed by the Divine. I truly wish that our culture would be more helpful in navigating us through our lives. Yet, our church community can be. We can see people around us in church who are daily try to love the Lord their God with all their heart and all their soul and all their might. I can think of people at every church I have served who inspired me. I encourage you to think of those who have inspired your spiritual walk. People who have shown you through their daily life what the words of the Bible mean. All Saint’s Day is about seeing the Divine Spirit moving in our world through the lives around us. We are inheritors of a living and lively faith. It is not an easy path, but it is one that is full of joy and meaning. Just look at the Saints!